Take what you’ve learned to the next level. We’re a great place to start your technical automotive service career. We find great value in the education available from specialty technical programs across the country. Because of the outstanding talent we identify through these schools, we are able to provide incentive programs designed to help graduates transition into the auto industry. You will find that our Service Operations team is made up of dedicated individuals, many of whom are recent graduates of automotive programs like yours. We are skilled, honest, enthusiastic, team-oriented, and great with customers. WE’RE CURRENTLY HIRING APPRENTICE AUTO TECHNICIANS FOR OUR STORES ACROSS THE COUNTRY. You’ll excel in the best settings in the industry: modern, clean, well equipped, climate-controlled, with the most innovative, state-of-the-art tools and technologies. You’ll experience an engaging workplace full of opportunities for skill development, award-winning training, advancement, and recognition for your performance. Incentives are only offered to students who join CarMax as the result of an on-campus recruiting event. On-campus visits and how to apply. We’re hiring automotive graduates to work in our fast-paced, climate-controlled shops nationwide. If we are scheduled to be on your campus soon, please work with the Career Services or Placement Department to make an appointment with us during our visit. If your school isn’t listed below, you can use this website to apply today to a store near you! 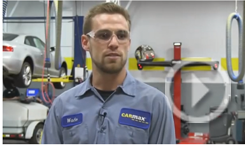 CarMax is hiring! Come visit us at the career fair to learn more about the jobs we have available in your area! CarMax is hiring! Come interview with us to learn what it’s like to be a member of our Service Operations team! CarMax recruiters and store management associates will be at WyoTech interviewing for positions nationwide!